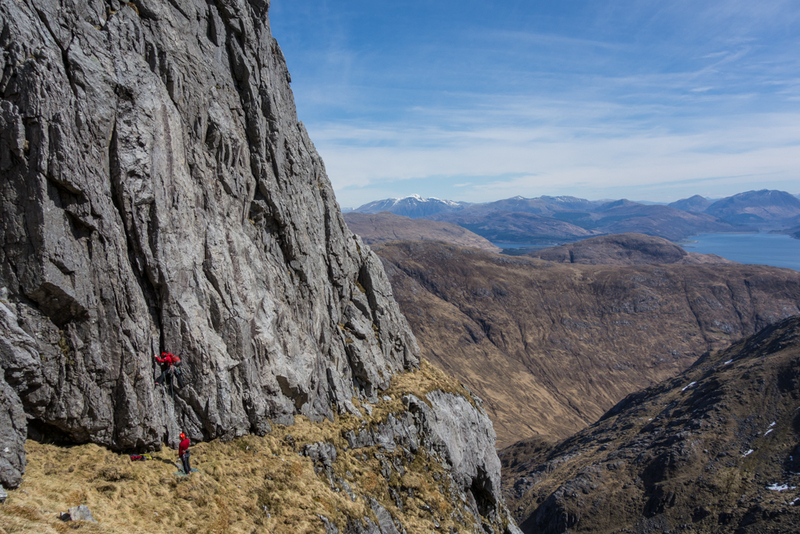 A few days of dry weather and the onset of high pressure promised to bring dry rock and good times to the west coast of Scotland last weekend. Rob and I sped over to Glencoe after work on Friday to meet Andy and Strong Joe at the Kings House, where we hatched some plans over beers. Full of bravado and Trade Winds we turned in for a frigid nights sleep on the moor behind the hotel. 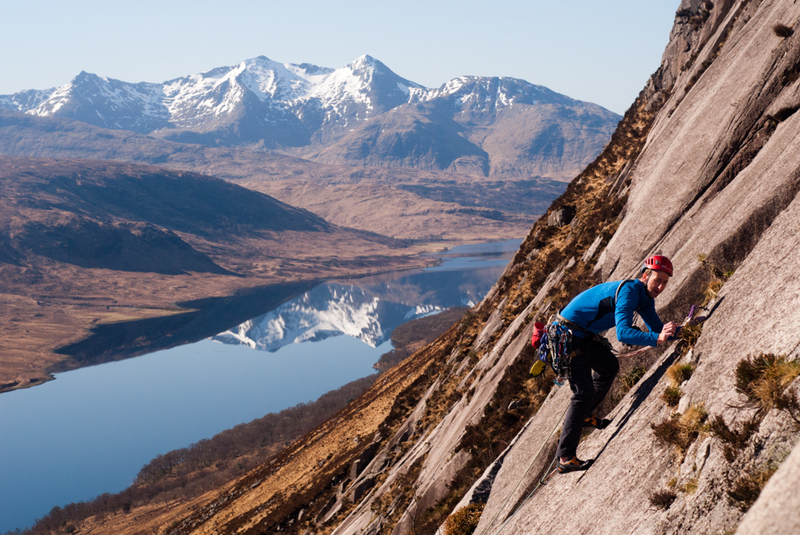 Waking to a hard frost and a sheen of frozen condensation on the tent, we opted to batter straight down Glen Etive in search of the sun and the notorious Slabs of Beinn Trilleachan. 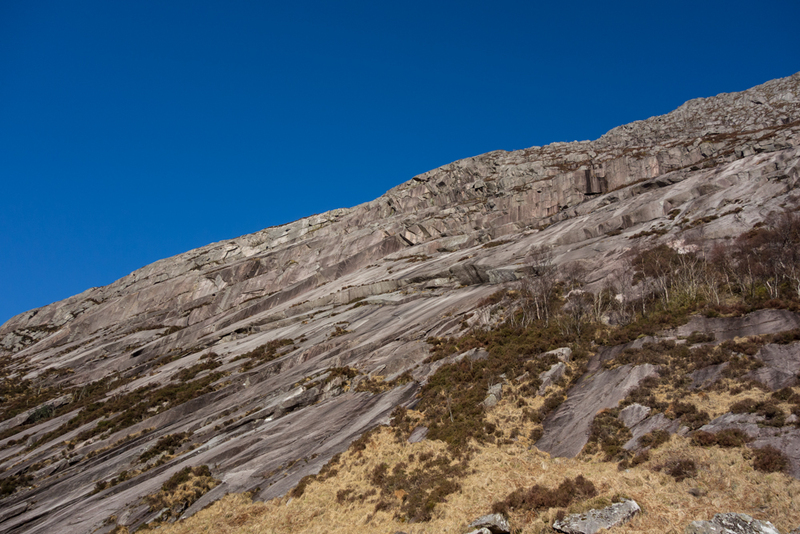 These massive slabs are set at an angle that varies around 40 degrees resulting in the highest concentration of friction climbs in Scotland – routes that rely mainly on your shoes sticking to the smooth stone rather than on hand and footholds. With a couple of notable exceptions, this means the climbing is tenuous, bold and very committing. The probability of successfully reversing friction moves is very low, unless you’re a ninja, so a cool head is required to climb here. After only a few metres of climbing on The Pause, however, my hubris and any notion of keeping a cool head immediately evaporated when I realised the slabs above were covered in a thick black slime. 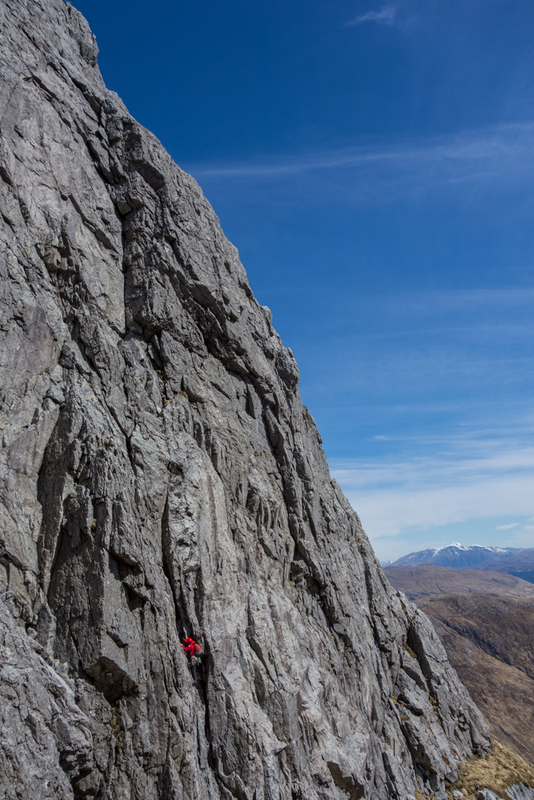 Some gibbering and quivering ensued until Rob sensibly suggested we traverse right on to the less serious, but nonetheless superb, Spartan Slab. This classic route meanders from left to right across the slabs, linking actual features amidst of sea of blankness. All pitches contain some friction-dependent sections, but with adequate protection they can be savoured rather than sweated! 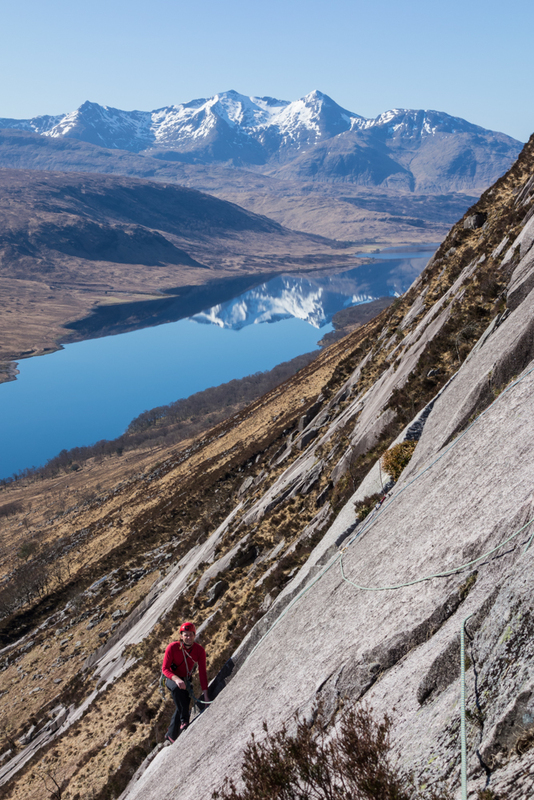 Having both climbed the route before we made good time, only pausing for photos and to soak up the atmosphere on the brilliant third and fourth pitches. 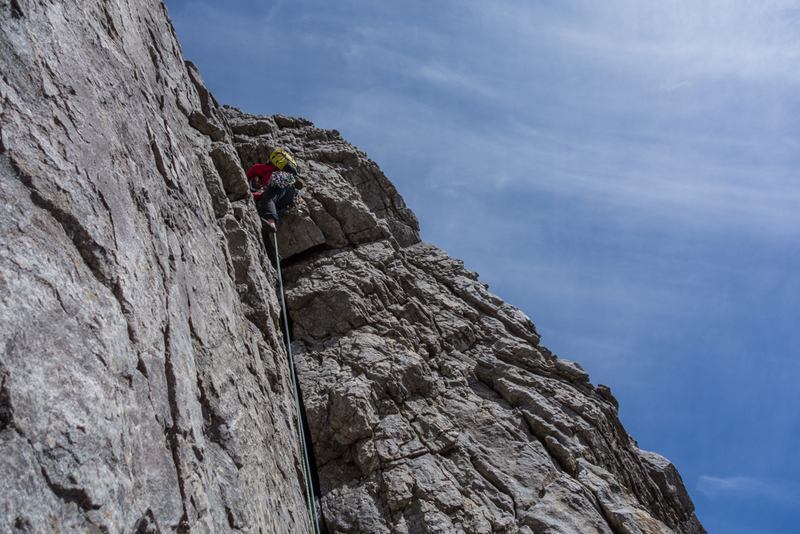 These constitute the technical cruxes of the route and involve the only overhanging section, which is in stark contrast to the more delicate and balancy moves that follow. 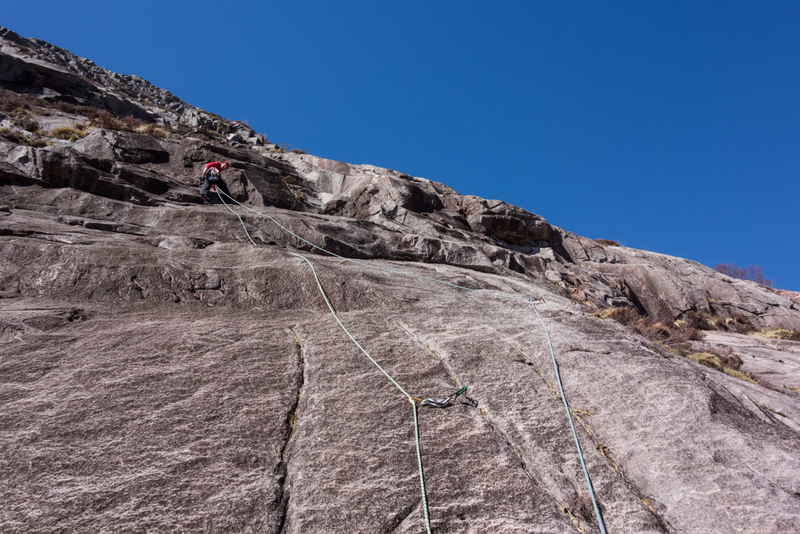 Even though not technically as hard the previous pitches, the final pitch provides a bit of a sting in the tail as the climbing relies more on friction than on any other part of the route. After a bit of a wobble, the final runout section to the top was despatched and we scrambled off and down the exposed descent ramp. 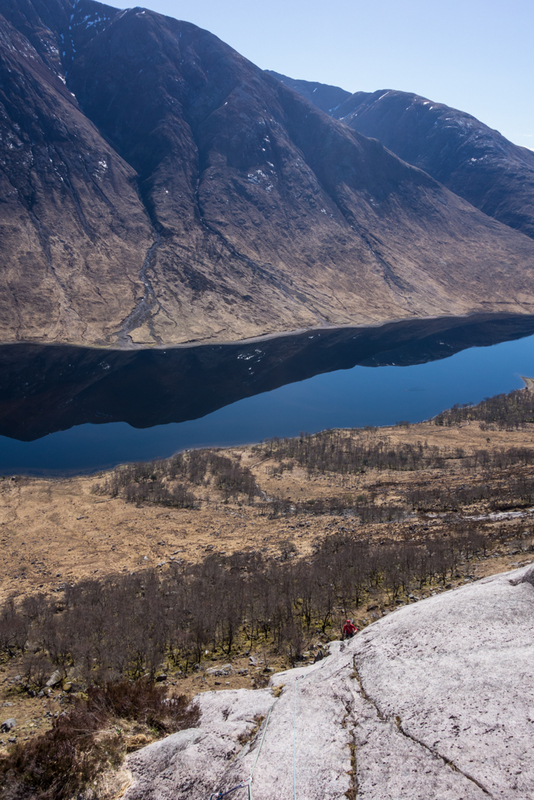 After finding The Pause still slimy, Andy and Joe decided to head back up the glen to Scotland’s most photographed mountain, Buachaille Etive Mor, and proceeded to race up Curved Ridge and back down in the incredible time of 3 hours. This was even more impressive considering the size of the remaining steep snow patches and the fact they only had one walking pole each! Unfortunately they didn’t have time to take any photos. 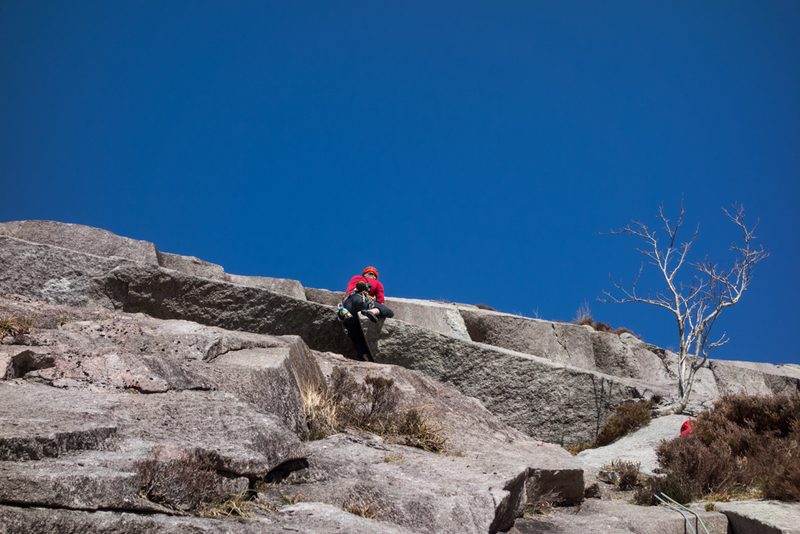 Meanwhile, back on the Slabs, Rob and I had elected to try a notoriously bold E1 called Raspberry Ripple. I had planned to lead the relatively safe first pitch, but one look at the apparent blankness told me discretion and functioning lower limbs were the better part of valour, so I passed the reigns over to Rob. 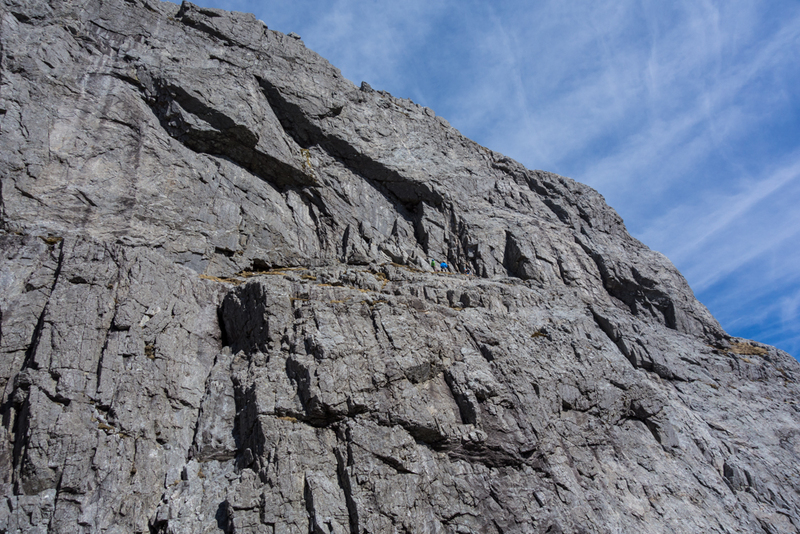 On this kind of terrain Rob is apparently immune to fear and romped up the pitch to a comfy belay on the upper slab. 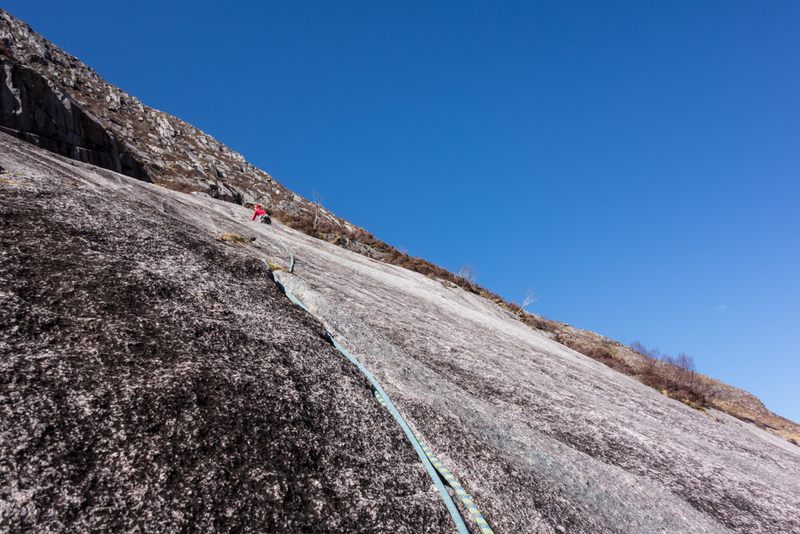 The last pitch really is something else – almost all on friction, longer than 60m and with the only piece of viable protection coming after 30m of climbing, it’s really not one to fall off of. Then again, you would have to try really hard to actually do that! To really spice things up, Rob ran out of rope well short of the belay. This necessitated some rope jiggery pokery but eventually I found myself padding up after him – a very enjoyable pitch with a nice top rope! With nerves well and truly frazzled we headed back to base for cocktails and medals, ready to begin scheming for the next day. 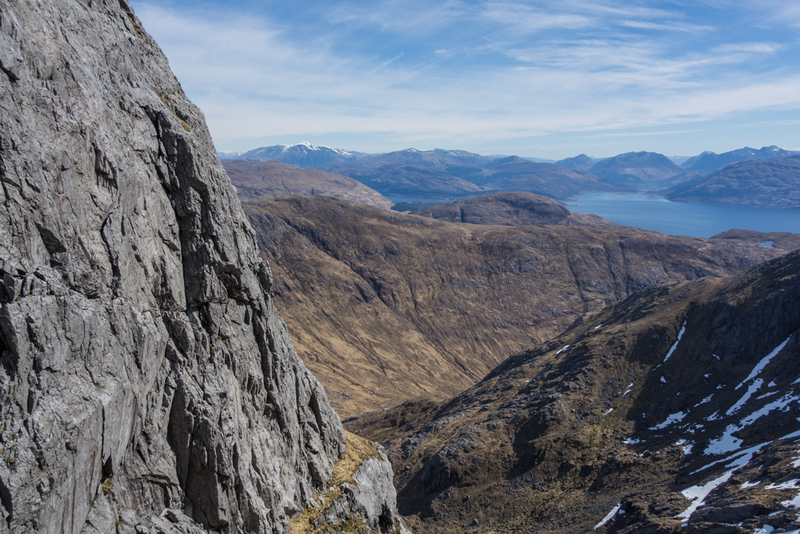 Joe was to join Rob and I and we all fancied an adventure in a wild place, so with a sunny south-facing aspect, immaculate steep rock and unparalleled views, Garbh Bheinn’s South Wall seemed like a good choice. Having never visited the Ardgour peninsular before it was great to catch the ferry over from Corran to a new part of Scotland. The trudge up the steep south flank of the mountain was less-than-great but the views that greeted us from the summit were incredible. A quick descent to the bealach south of the main top led to an undignified sketch down wet snow, grass and damp slabs to the base of the cliff. 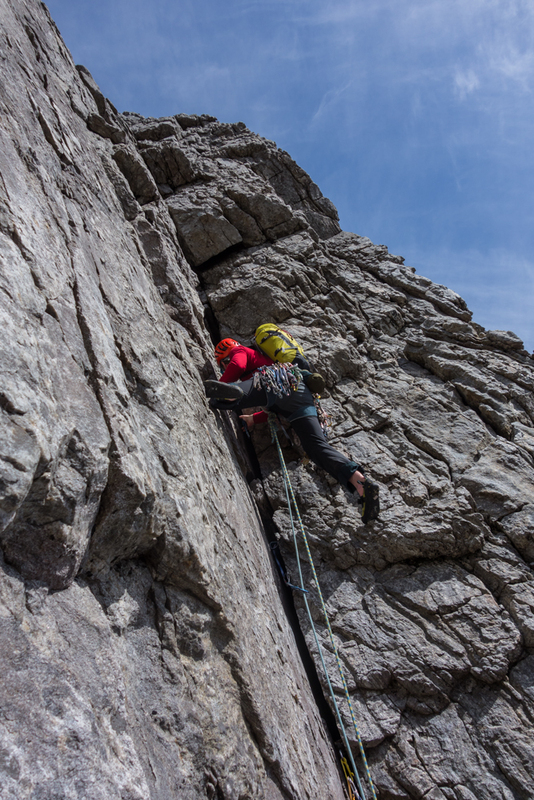 The cliff is seamed with outstanding climbs but the classic of the crag and a candidate for one of the best routes of it’s grade in the UK is Butterknife. Beginning with a chimney-groove the line continues straight into a perfect corner capped with a two-tierd system of small roofs. A further two pitches don’t quite live up to the quality of the first but still provide a great way to the top of the crag. The first two pitches of Butterknife seen from the descent gully. 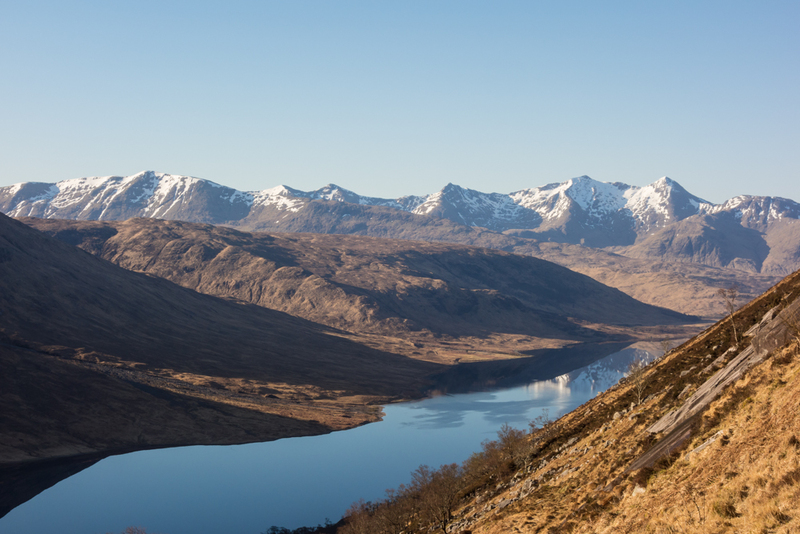 Ben Nevis, The Mamores and Glencoe beyond. We all thought the pitch was fantastic, but standing at Rob’s dubious belay gazing up at the corner, it was obvious that the fun was just beginning! 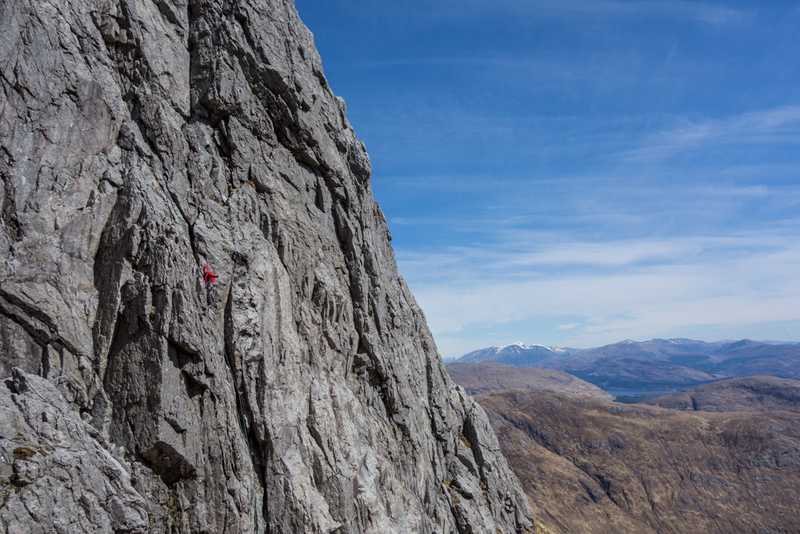 We had originally intended to climb Excalibur on the upper tier but with the descent back to the car and then a 4 hour drive to Aberdeen looming, we decided to save that for another visit and finished up the final pitch of Butterknife to the top. Not that we really needed an incentive to come back to this place!